We are excited to return to Flushing Meadows for our fifth year. 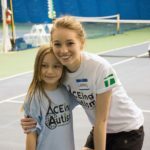 To have an ACEing Autism program run alongside the US Open is a wonderful opportunity to bring awareness to autism and how our tennis program is making a positive impact with families that have a child with autism. Our clinic is really a celebration for our team of program directors who all love the game of tennis and are so passionate about teaching the sport to children with autism spectrum disorders. R.S.